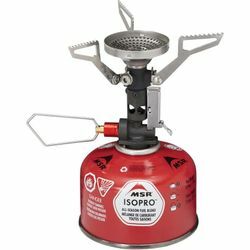 MSR PocketRocket Deluxe Stove. This enhanced PocketRocket stove boasts premium features, including a pressure regulator that makes it ideal for all-condition environments, offering consistently faster boil times than non-regulated canister-mounted stoves. Just a smidge heavier (10 g/ 0.3 oz, or the weight of two nickels) than the PocketRocket 2 stove, this ultralight deluxe version features the most durable push-start Piezo Igniter we've ever built and a broad burner head for better heat distribution and simmering. For backpackers traveling fast & light on the trail, or a quick weekend in the Cascade Range, this deluxe model offers one of the best overall cooking experiences in its ultralight class.